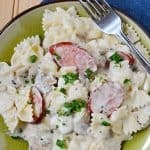 This Creamy Cajun Sausage Pasta is an easy family meal that everyone loves and is perfect for busy weeknights. The homemade creamy white sauce is the perfect backdrop for cajun spices and the recipe works wonderfully with sausage, chicken, or both! Saute mushroom and onions with Cajun seasoning, add meat and saute a little longer. Turn down heat on the meat and veggies. Add in your milk and cream. Keep stirring over medium to medium low until sauce starts to thicken. Add Garlic, basil and Parmesan cheese. When pasta is cooked, drain and add to the meat and cream mixture. Combine well.